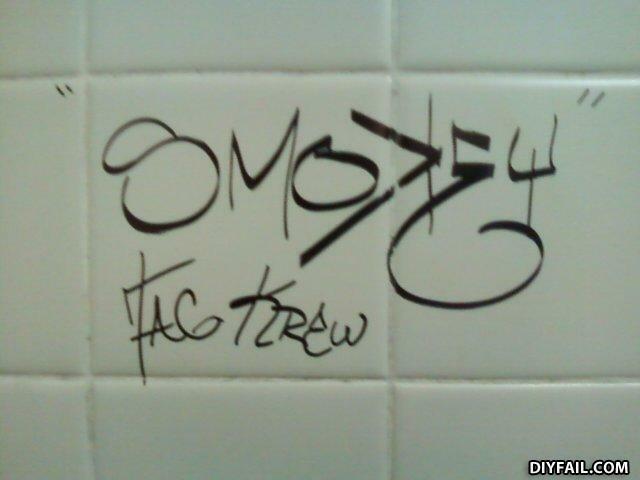 Pretty sure it says, "Fàg Krew." Figures they'd write it on a bathroom wall. "Smokey" probably means he likes smoking the meat cigar. Perhaps our homey Smokey has a little sumpin' sumpin' on the down low but don't want his buds in the Krew to know 'bout it, so he be working it into the tag all freaky deaky like? Now if only I knew what I just said. Did it hurt when you burst through the concrete emerging from hell?